Michelle Fire opened the Uptown bar, Big Chicks (5024 N. Sheridan Road) on December 11, 1986. 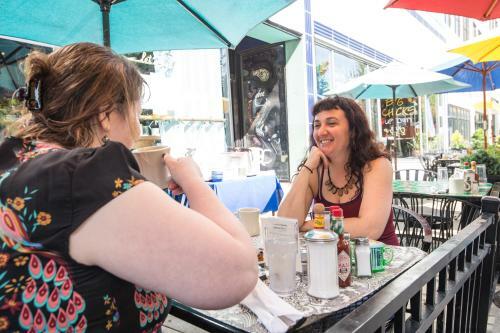 From the start Big Chicks has been a neighborly and inclusive LGBTQ-focused watering hole. Since the beginning, Fire has also made sure that Big Chicks has been an integral part of Chicago’s LGBTQ and Uptown communities. Big Chicks has sponsored numerous LBGTQ sports teams, held political fundraisers, hosted benefits for numbers AIDS and HIV organizations, offered game nights, and presented artistic performances. The popular night spot has also hosted various LGBTQ friendly events including Feast of Fun, Homolatte, a queer all-inclusive dance party, and much more. Because of its longstanding service to the LGBTQ community, in 2016 Big Chicks was inducted in the Chicago LGBT Hall of Fame. Another notable characteristic of Big Chicks is the array of incredible artwork and photography on display. 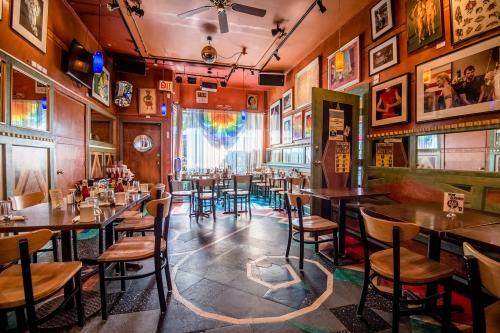 The walls of the bar and its adjoining sister establishment, Tweet, are decorated with over 150 pieces of original art and represent some of the favorite works from Michelle Fire&apos;s private collection. The pieces on these gallery walls include numerous artists and photographers from the Chicago art scene as well as those with both national and international acclaim — names such as Leon Golub, Abelardo Morell, Ruth Bernard, Weegee, and Lisette Model. There is a lot for aficionados of design to see here as well. The full decor of Big Chicks is a stunning work of art — from the neon lighting to the tile design on the floor to the vintage fixtures and furniture. Every inch of this place has been put together with a cohesive aesthetic and an eye for detail. Other popular items on the healthy and eclectic breakfast and luncheon menu are Chilaquiles (a traditional Mexican dish), the Vegan Southwest Tofu Scramble, The Santa Fe Special, The Portobello Burger, The Croissant Sandwich Platter, Breakfast Burritos, and Abeleskiver (the Danish equivalent of donuts). Tweet also features “Artist Special” meals and a gluten-free menu. For lunch and a glass of wine, Fire says the Terzo Piano Restaurant (The Art Institute of Chicago, 159 E. Monroe Street) is lovely. “Then you can walk over to Macy’s (111 N. State Street) and look up at the beautiful mosaic ceiling in the center.” Another of Michelle’s picks for a real Chicago gem is the Cadillac Theater (151 W. Randolph Street) and while you’re there she recommends the back stage tour. If the weather is cooperative, Fire is also a big fan of the Architectural Boat Tours which is one of the finest ways to get a unique perspective on the city as well as many of Chicago’s loveliest buildings. 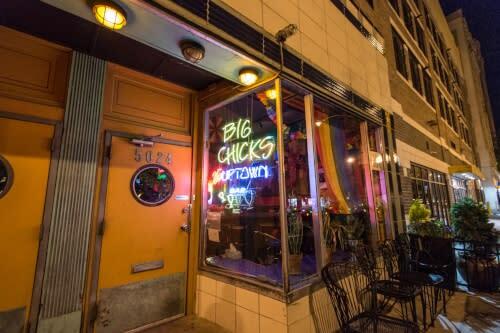 Big Chicks is one of the friendliest and most welcoming bars in Chicago. 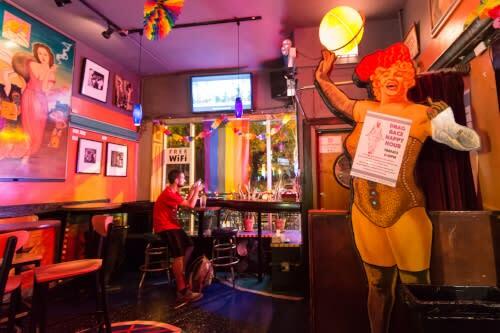 This nightspot has been an institution in Chicago’s LGBTQ and Uptown communities for decades. Plus, if you’re in town for a visit and the timing is right, Big Chicks even has a decades old tradition of a complimentary Sunday BBQ. Learn more at bigchicks.com.